2012 – ongoing | The existing highways A1 and A6 between Amsterdam and Almere are renovated, extended and partly relocated by SAAone (VolkerWessels, Hochtief, Boskalis, DIF). 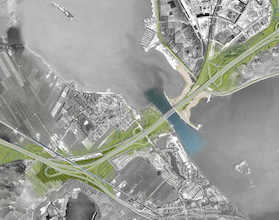 This 30 year DBFM-contract (Design, Build, Finance and Maintain) covers 20 kilometres of highway with over fifty new structures, such as a new concrete bridge across the Amsterdam-Rhine canal, a new aquaduct in the river Vecht, a steel railway bridge (255 m), the second Hollandse Brug and a the renewal of highway interchange Muiderberg. Michel Heesen is project leader/ architect of this project in commission of ZJA/Okra, who are responsible for the architectural and landscape design of the project.